in a fun online educational physics class game. 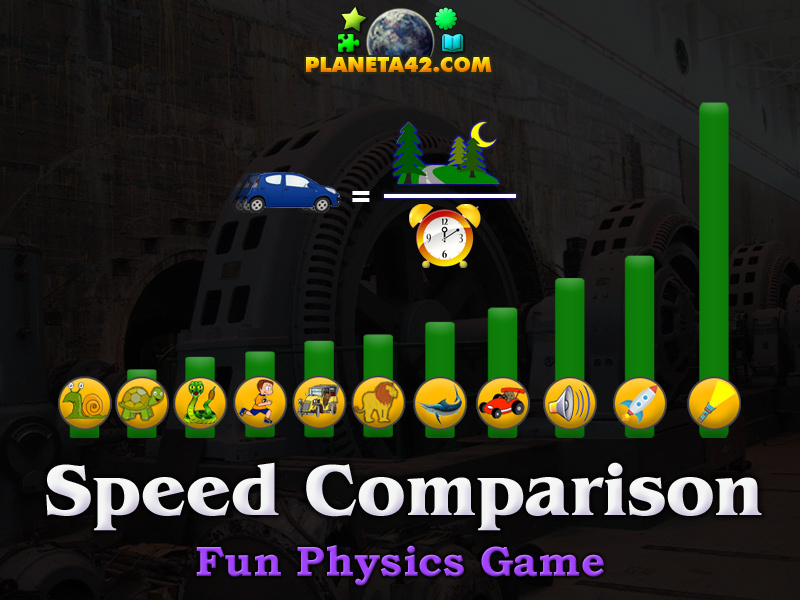 "Speed Comparison" is a free online knowledge level game about the Speed. The task is to arrange the objects in ascending order according to their speed and achieve +1 Knowledge Level. Speed learning game. A small fun mosaic game for desktop computers, laptops and tablets, which may be played in the web browser. The Physics Knowledge Board include 11 units of moving objects to play with. Interactive Physics Workshop educational tools. Which is the fastest thing ever? What is the basic formula for finding speed? What is simple speed formula? How fast is the human? How fast is the snail? How fats is the sward fish? How to play Speed Comparison. There are 11 round pictures of animals, machines, sound and light, which will appear randomly on the top of the screen. Drag and drop them in the correct slots according to their average speed at the bottom of the screen. Know the speed of sound. This fun game is designed for learning the speed formula for kids. Elders can practice for fun too. May be suitable for physics classes or any fun education. Labels: Mosaic Games , Puzzle Games , Flash Games , Physics Games , Education Games , Free Online Games.